The Echinoblog: What we know about the world's most venomous sea urchin Toxopneustes fits in this blog post! Toxopneustes! aka the "Flower Urchin" is one of four species of Toxopneustes (all of which occur throughout the tropical Pacific). One species, Toxopneustes pileolus is one of the most frequently encountered and as such, this is the name most often applied to sea urchins that have the distinct appearance (as seen above). 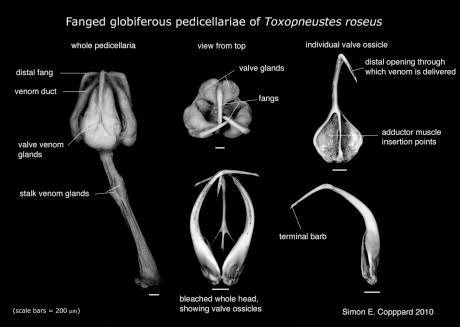 Toxopneustes literally means "toxic foot"undoubtedly alluding to the MANY venomous pedicellariae that compose the animal's appearance. I'll explain "pedicellariae" more below..but just so you know what I'm talking about? ALL of those yellow circles and traingles in the picture above? Those are tiny little claws and each one of them is toxic. So be careful around these guys..
Toxopneustes has all of the other stuff that you see in other sea urchins, such as spines and tube feet. The circles and triangles below are pedicellariae. Round means the pedicellariae are "open" and the triangular ones indicate the pedicellariae are either closed or are closing. The brown rods below that kind of look like toothpicks? Those are the spines, which are actually not themselves toxic (as far as I've read). Toxopneustes has been known for quite a long time. The genus was described in 1841 by Louis Agassiz, so we've had some time to think about it. 1. Toxopneustes pileolus displays covering behavior. I have discussed and blogged about "covering behavior" in the past (here). Toxopneustes is a "collector" urchin, which means that it shows the curious behavior of adding rocks and other debris using tube feet and/or pedicellariae to cover over itself. Although the reasons are not well understood, it is thought that this could serve to protect the urchins from ultraviolet rays. In some cases with other urchins, its thought that the materials serve as defense, but given the highly venomous pedicellariae on this species, I kinda doubt that's the case here. One paper, which studied the East Pacific species, T. roseus (here) suggested that the covering response protected the animals against wave surge while they fed on coralline algae in rhodolith beds. 2. Flower urchins spawn in the Spring and "undress" their covering materials to do it! This one is self-evident since all animals have to reproduce. And most echnoderms spawn externally. But it was only recently in a paper by Andy Chen and Keryea Soong in Zoological Studies in 2009 which showed that they showed Toxopneustes pileolus "release" all of the materials obtained via their "covering response" before they spawn. Here is Figure 1 from Chen & Soong 2009. Showing on the left, a "covered" urchin and then on the right an urchin "uncovered" and spawning. Here we have the #1 feature, this sea urchin is known for: its sting! One species in particular, T. pileolus is regarded by the 2014 Guinness Book of World Records as the "most toxic" of sea urchins (see lower left corner). Here is more of a closeup of each one. Each with a stalk connecting them to the body. They are round when open and more triangular when closed. Here's a diagram of one, showing the hard parts within all of the softer covering. Basically, each one is a claw that injects poison. And below is a nice SEM image of a similar kind of pedicellariae from the East Pacific species. 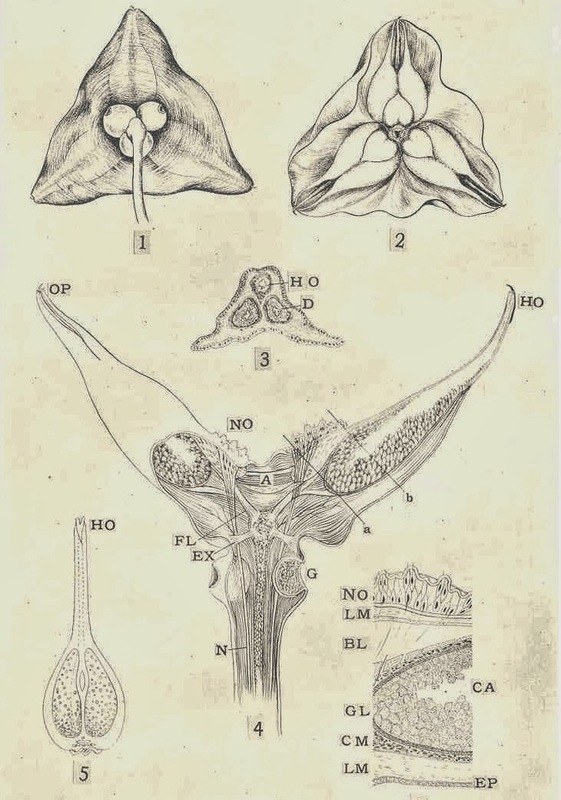 Toxopneustes roseus showing it in more detail. 4. How Toxic are they?? From this Japanese blog. Do not do this. It will hurt (I mean the pedicellariae. Going to the blog shouldn't hurt). On June 26, 1930, while I was working on a fishing boat on the coast of Tsuta-jima in Saganoseki, I scooped up with my bare hand an individual of the sea-urchin which had been carried up by a diver with a fishing implement on the water surface from the sea-bottom about 20 fathoms in depth, and I transferred the sea-urchin into a small tank in the boat. At that time, 7 or 8 pedicellariae stubbornly attached themselves to a side of the middle finger of my right hand, detached from the stalk and remained on the skin of my finger. Instantly, I felt a severe pain resembling that caused by the cnidoblast of Coelenterata, and I felt as if the toxin were beginning to move rapidly to the blood vessel from the stung area towards my heart. After a while, I experienced a faint giddiness, difficulty of respiration, paralysis of the lips, tongue and eyelids, relaxation of muscles in the limbs, was hardly able to speak or control my facial expression, and felt almost as if I were going to die. About 15 minutes afterwards, I felt that pains gradually diminish and after about an hour they disappeared completely. But the facial paralysis like that caused by cocainization continued for about six hours. Other accounts have detailed stopping oyster hearts, and contraction of smooth muscle, including cardiac (heart) tissue. Some accounts of Toxopneustes have stated that swimmers have drowned following stings but I wasn't able to verify an account of this. Is it any worse than the venom in other poisonous urchins, such as these echinothuriid "fire urchins"??? That's a bit of a cheat. We DID know that commensal crabs live on Toxopneustes. Apparently, these striped little fellows are called Zebrida adamsii. The name "Zebrida" undoubtedly hailing from the zebra-like stripes on the animals' body. Here's one living on Toxopneustes pileolus with some eggs! But what is REALLY interesting is just HOW these crabs live on the urchins! Look at the video below. They actually CLEAR off the pedicellariae and spines and live on a bare patch of the animal surrounded by all the poisonous pedicellariae and etc. How far/how long do they hitch a ride? Do they feed on the tissue from the tube feet and pedicellariae? Are the crabs as well camoflaged as they seem? Interestingly, note also that the pedicellariae are all open and seemingly comfortable. Does that mean they are pretty cool with the crabs living on them that way? What do the urchins get out of it? IS Toxopneustes REALLY the world's most venomous sea urchin??? I have had one in my tank on occasion. Never had a problem getting stung. I've got some good photos of it covering itself with things like seaweed rocks shells snails and hermit crabs. Not sure what it is eating but I think it's purple rock coral? I stock my seasonal tank with tide pool fish from sea of Cortez. I keep my fish then realease them when they outgrow the tank. I realease everything eventually since I don't live in Baja year round. I've kept these flower urchins before and never been stung. They are fascinating. They do move the rocks in my tank around quite a bit. I never keep them more than a month or so because I'm not sure they are actually getting enough to eat. They do poop pellets out of the top of the shell. I have a sea cucumber and it is not molested nor any other animals in there so it must be eating algae or purple rock corals. Within the following 5 to 10 minutes her affected skin area became severely red and irritated. Her whole face became severely swollen and the colour of her face changed to a ghostly white. Her lips also became white, while her hands and feet became bluish/purple and quite cold. She vomited and water with lime was given to her. After about 30 minutes she ingested half a teaspoon of antihistamine syrup. The simptoms gradually diminished and then eventually faded away after a few hours. Her colour also came back to normal after a few hours. It was a very heavy and stressful experience for her as well as for her loved ones directly involved. Lots of prayers were said and we are grateful that everything turned out for the best after all. hello how recently I touched one, I picked it up when I was snorkeling and nothing happened to me, the urchin apparently was hurt but it is already seen that there are several cases in which simply nothing happens, to which there must be some explanation but how these animals are little studied that is the reason.